[PDF] The Big Book of English Verbs with CD-ROM (set) (Big Book of Verbs Series) | Free eBooks Download - EBOOKEE! Description: All the English verbs you need to know in one place! This comprehensive guide is your one-stop resource for learning English verbs. It includes 555 of the highest frequency verbsunlike Barron's 501, which excludes common verbs such as "answer" and "wash"with conjugations and sample sentences. 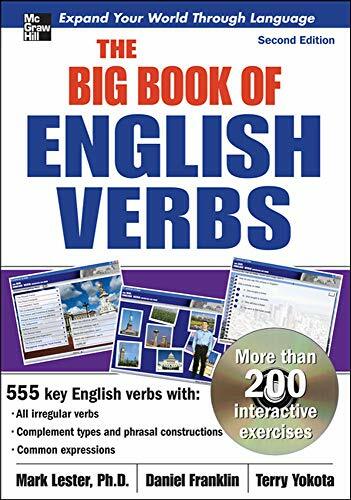 "The Big Book of English Verbs" also has a list of all complement types that are used by each verb, as well as all the common phrasal verb constructions that the verb can be used with in a sentence. The CD-ROM contains more than 200 interactive practice exercises, plus diagnostic and review tests to assess competency. No comments for "[PDF] The Big Book of English Verbs with CD-ROM (set) (Big Book of Verbs Series)".